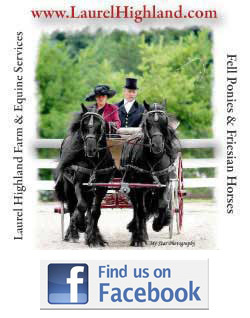 We also have a brand new page -- www.facebook.com/fellponies --more geared specifically toward our ponies/horses and other merchandise for sale. Check it out! 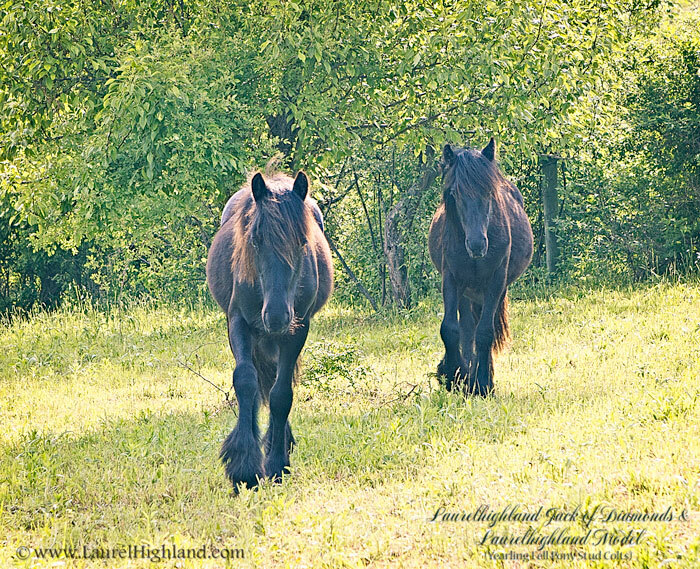 And also be sure and visit our brand new Laurel Highland Designs store at http://www.zazzle.com/laurelhighland* for Fell Pony and Friesian-themed merchandise and gifts, featuring our original artwork and photographs! 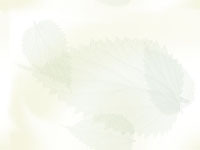 We will very gradually be adding new items so be sure to subscribe for updates on new products! a "smooch" when just a few hours old. What is "imprinting"? It is similar to the concept of imprinting ducklings. You know, if the duckling sees you before its mom at birth it will follow you around like its mother?! 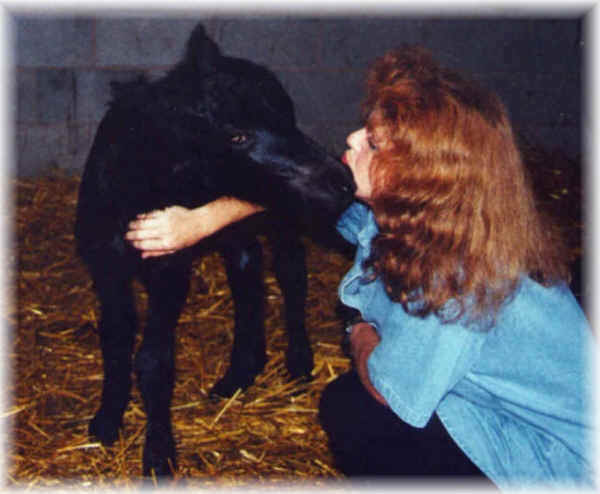 Imprinting a foal refers to a training technique developed by Dr. Robert Miller, DVM. But we prefer to think of this technique as "early desensitization" (to humans and other stimuli), because we are also very careful to avoid interfering with the bond (and bonding process) the foal has (and needs) with its own mother. 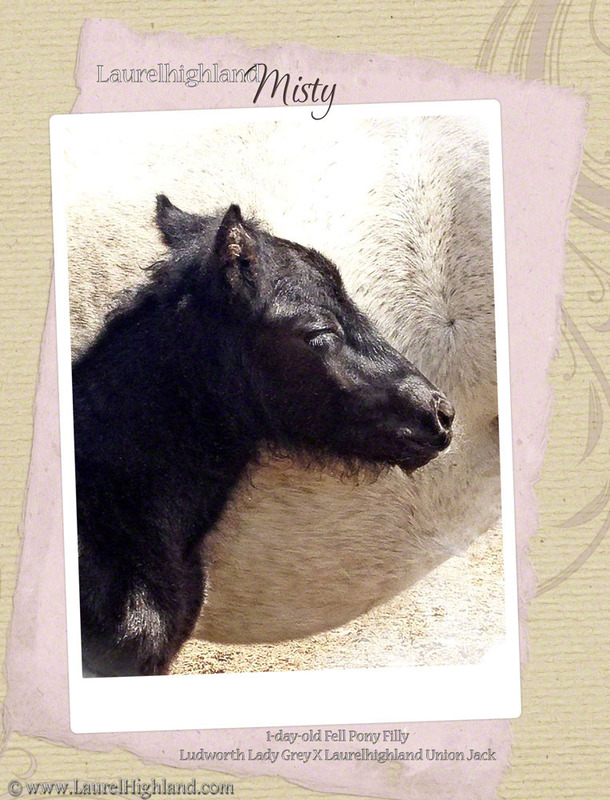 Nonetheless, at the time of birth, foals can absorb more information than at any other time. Lessons learned at this early age can last a lifetime. Imprint training is efficient (a lesson learned in a few minutes at birth can save HOURS of aggravation later if trying to teach an older foal the same thing). It also gentles the foals and prepares them for schooling later. 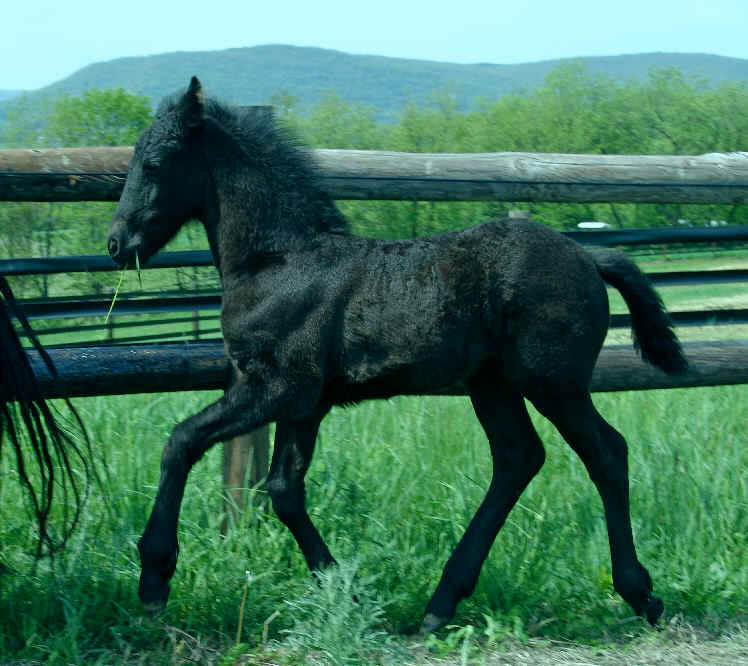 Early exposures to certain stimuli allow the foals to accept the same stimuli later without fear, especially regarding humans. This technique includes doing things like rubbing the foal all over, pulling at ears, putting on halter, pressure on poll, taking a temperature, picking up feet, making loud noises, etc. It works best if you work with the foal as soon as possible after it is born (even before it stands) and then repeat the exercises within the first 24 hours during the "receptive" period, before the "fight or flight" instinct overpowers the foal's natural curiosity and receptiveness. 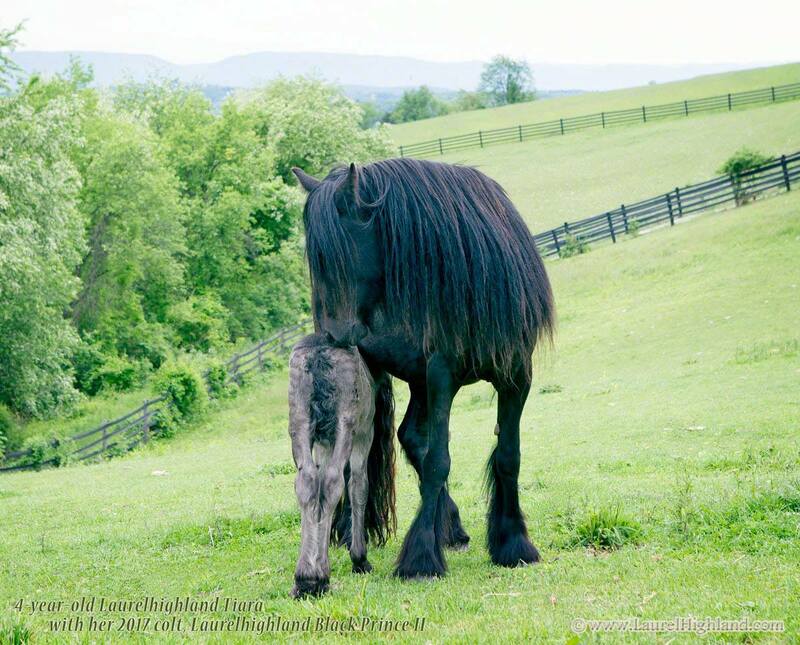 Immediately after birth, the foal at this stage will usually "let you do anything" with little fuss -- of course there is no guarantee Mom won't fuss but she is often too weary at this stage to fret or even notice, which makes the timing more ideal! For mothers that immediately attend to their foals after birth, we let them settle first so as not to interfere with their bonding. 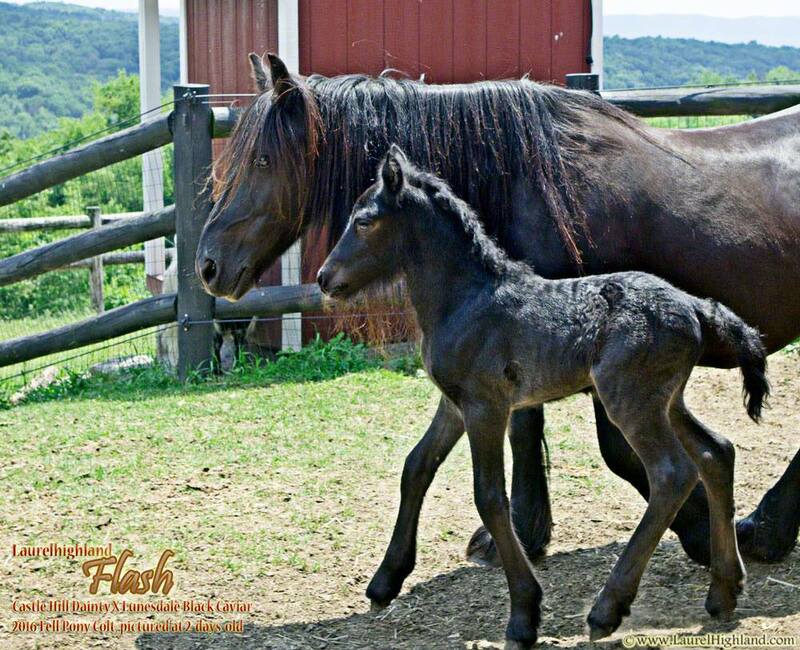 But within a short time, mom is hungry and usually won't mind me fussing over the foal while she has something to eat! If you don't use the technique within this early time frame, it doesn't work. We are believers in this method of training and make every effort to imprint (or desensitize) all our foals in a similar fashion. 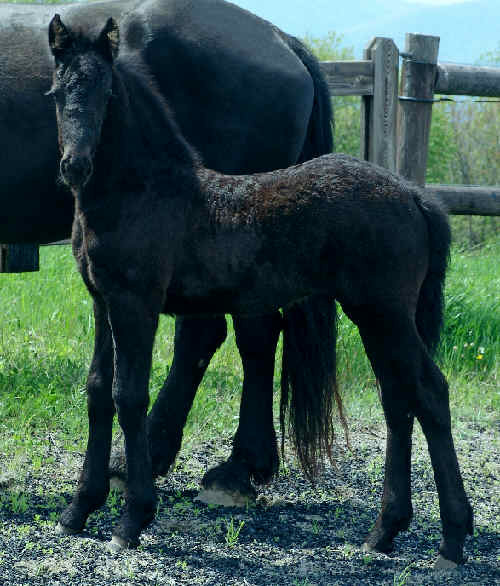 And when you start with a foal like a Friesian or a Fell that has a genetic predisposition to having a nice temperament, the combination is outstanding. 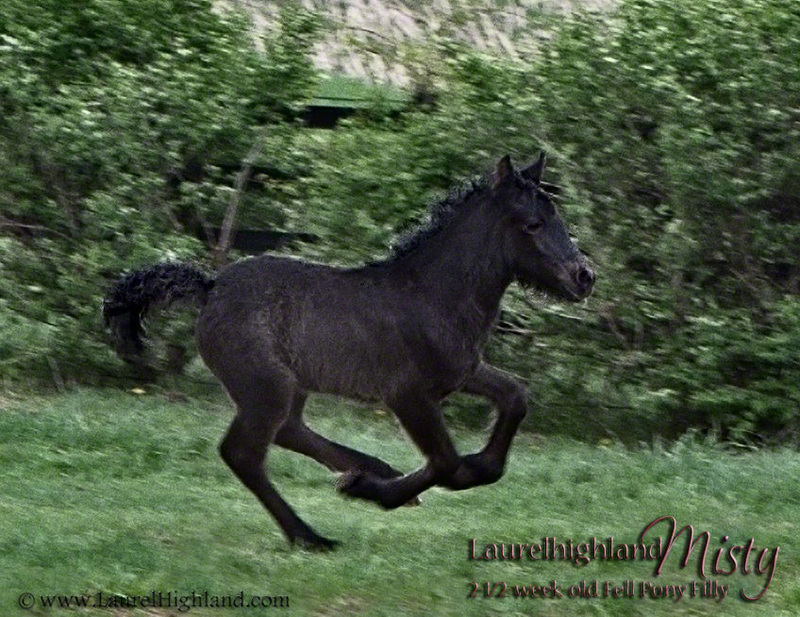 With barn camera surveillance, I was able to work with the Fell pony filly shown above within minutes of birth. (She was literally just hitting the ground when I saw she was born on our barn cameras.) I'm sure this early handling established a bond or trust of humans more easily, allowing her to be willing to briefly leave her mom and come over to me anytime I called, even when she was just days old. I'm sure her new owners will attest to the fact that she loves people and any attention they will give her! After this newborn "training", our foals continue to receive daily, individualized care, while also enjoying the additional social benefits of life in a herd. This combination of herd life and positive human interaction provides the foal with the best social skills possible, helping to prepare them for anything life has to offer! 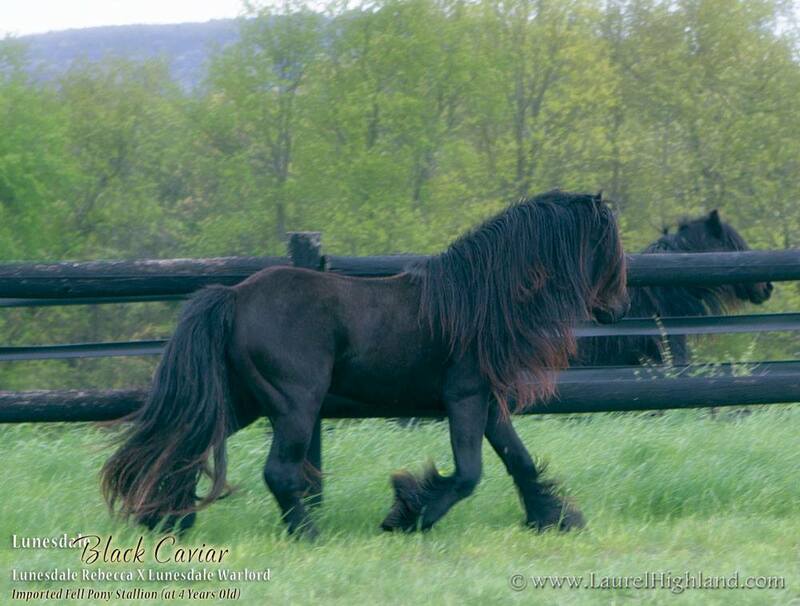 For more information about our breeding stock, see Our Fell Ponies or Our Friesians. 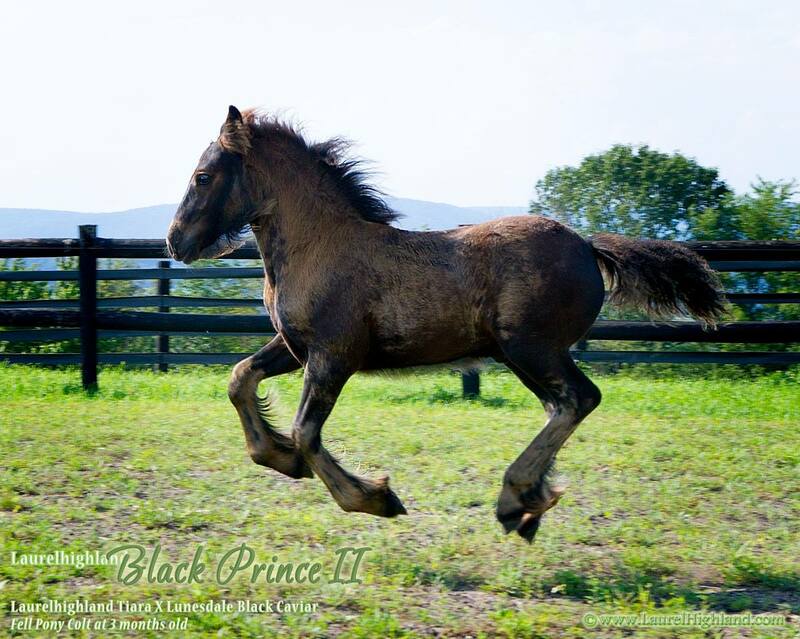 Many of our foals have been reserved before birth if not before conception! 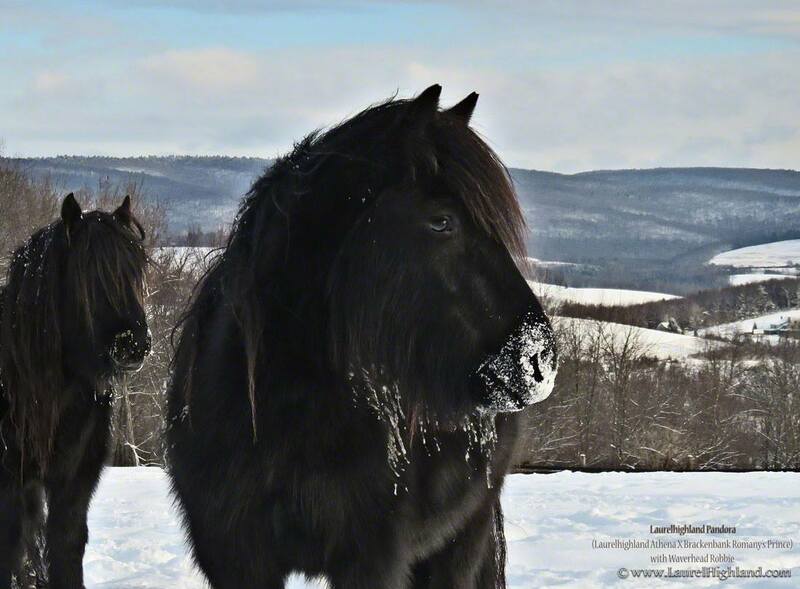 Please feel free to contact us for pricing information and currently available Fell pony and Friesian foals and/or weanlings for sale. We occasionally have older stock for sale. The list below is not necessarily up-to-date so please contact us directly if you are interested! Also, please note that although our foals are in high demand and are often reserved before birth for guaranteed sound/healthy foal, the sale is not finalized until foal is born and guarantee is satisfied. 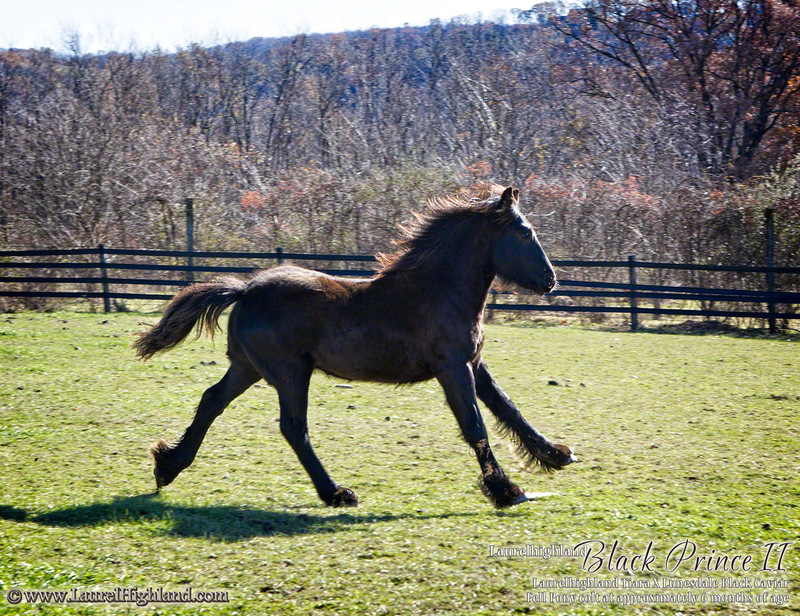 We have taken many years and great care in selecting top quality breeding stock and take great pride in all of them, and we strive for all of their offspring to live up to the same standard. . .or better! Note: Occasionally foals are reserved with a gender guarantee (either as fillies or colts) by return customers. Since we don't know the gender in advance, a few of these could thus become unexpectedly available after birth if they are born the opposite gender. 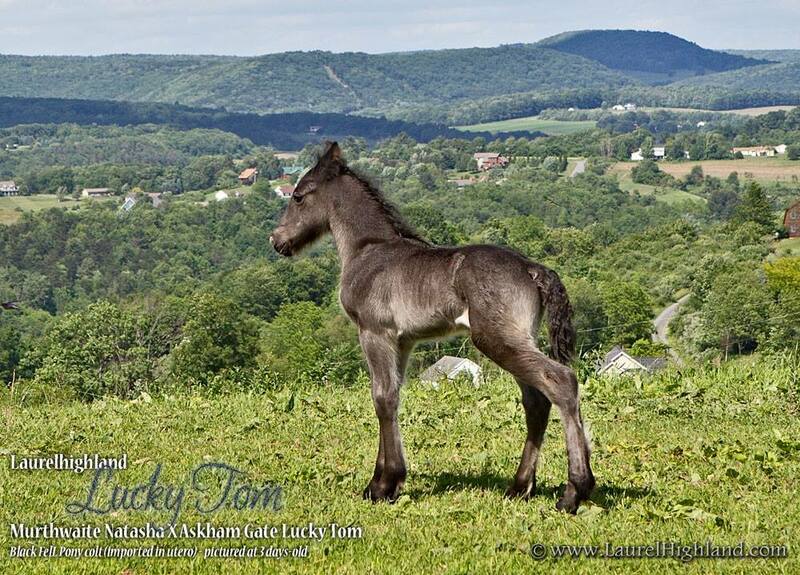 If you are interested in going on the waiting list for our foals, please contact us. 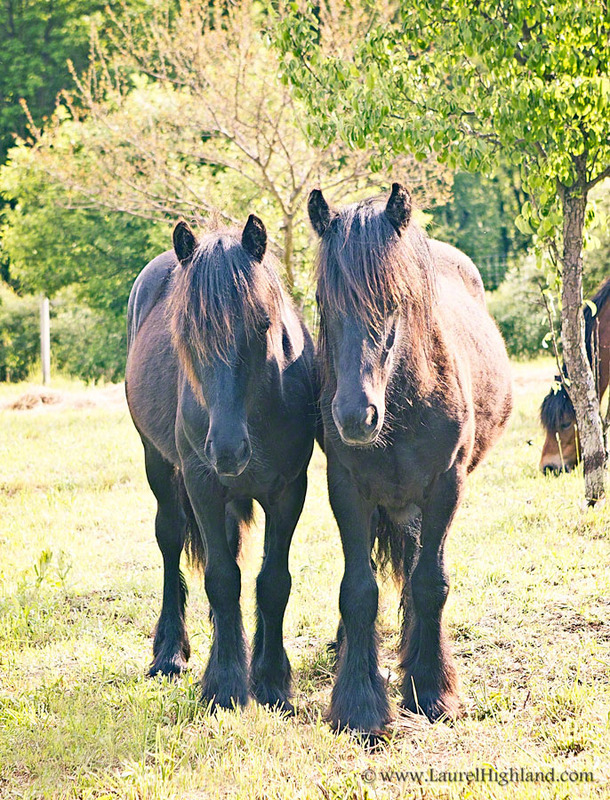 All of our Fell pony foundation breeding stock were carefully selected and imported from their native England. 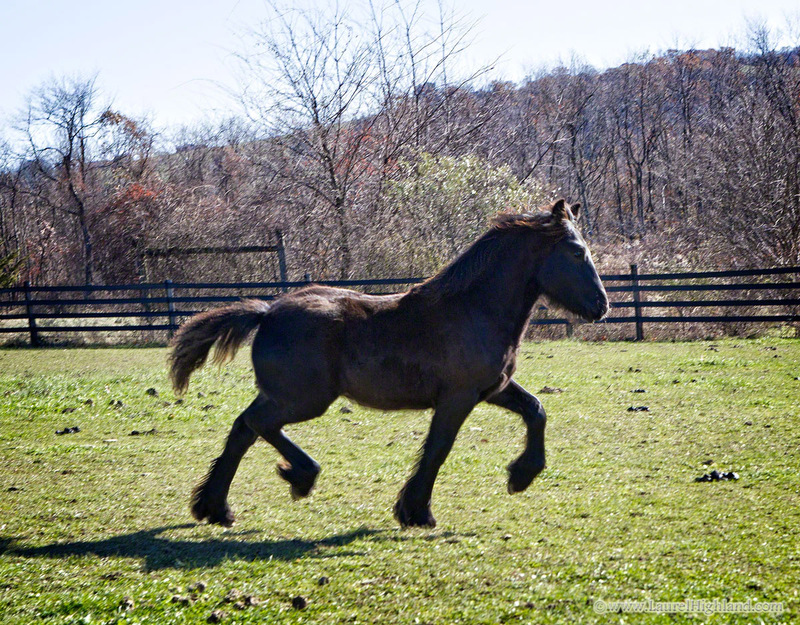 Please see our Facebook page for more updated photos of ponies! WE OCCASIONALLY ALSO HAVE OLDER STOCK AVAILABLE FOR SALE, BUT THEY RARELY MAKE IT ONTO THIS SALES LIST! PLEASE CONTACT US IF YOU ARE INTERESTED. Note: Any pony listed below which bears the "Laurelhighland" prefix has been bred from the highest quality imported English stock and raised here at our farm. Those ponies listed below bearing any other "prefix" were imported from England. Please contact us for more information if you are interested in any of these foals. 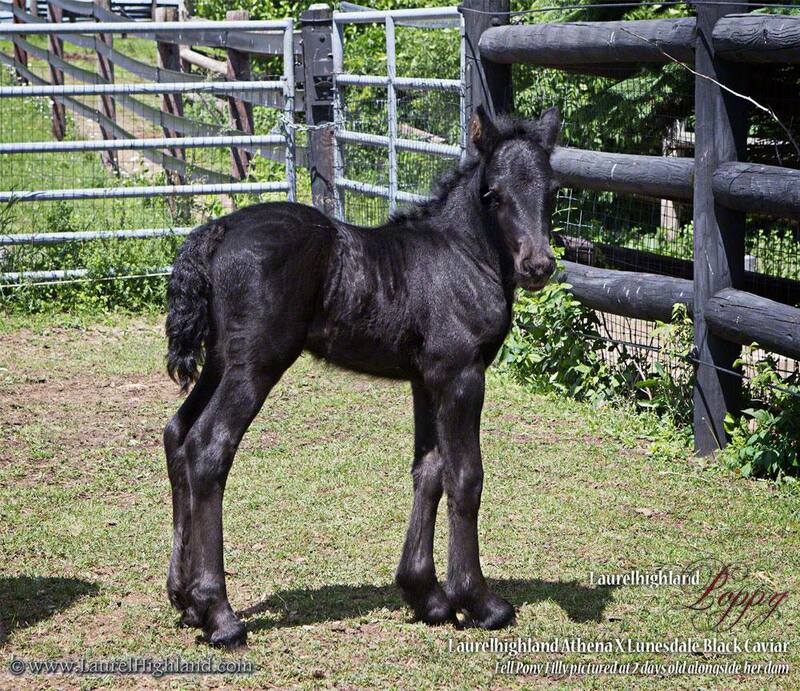 2017 Black Colt "Laurelhighland Black Prince II"
Extremely athletic with superb conformation and movement, great bone, lots of hair, and very sensible and extremely friendly personality. 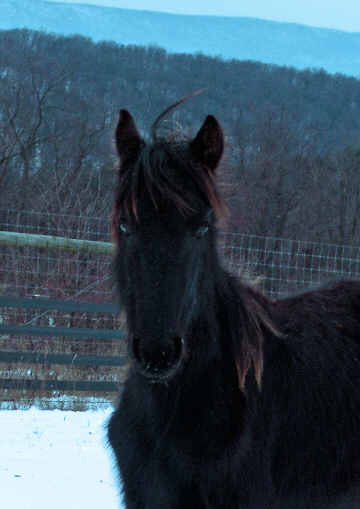 (If he was a filly, we would be keeping this one for breeding!!!) 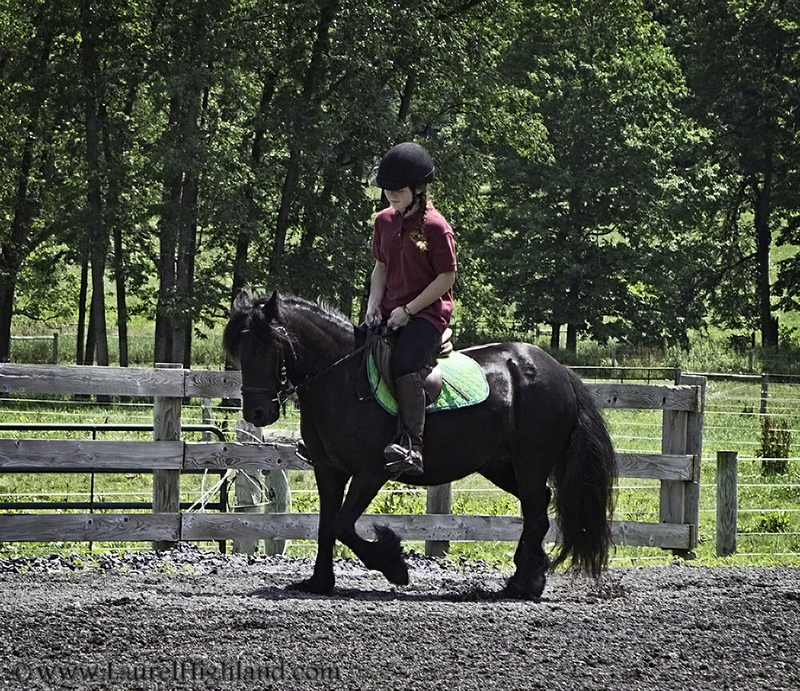 Should make an ideal performance performance prospect under saddle and/or in-harness. Born May 2017, he is out of the stunning Laurelhighland Tiara and is by the imported stallion, Lunesdale Black Caviar. We are not expecting 2018 foals out of our other broodmares as they are all enjoying the year off from breeding! 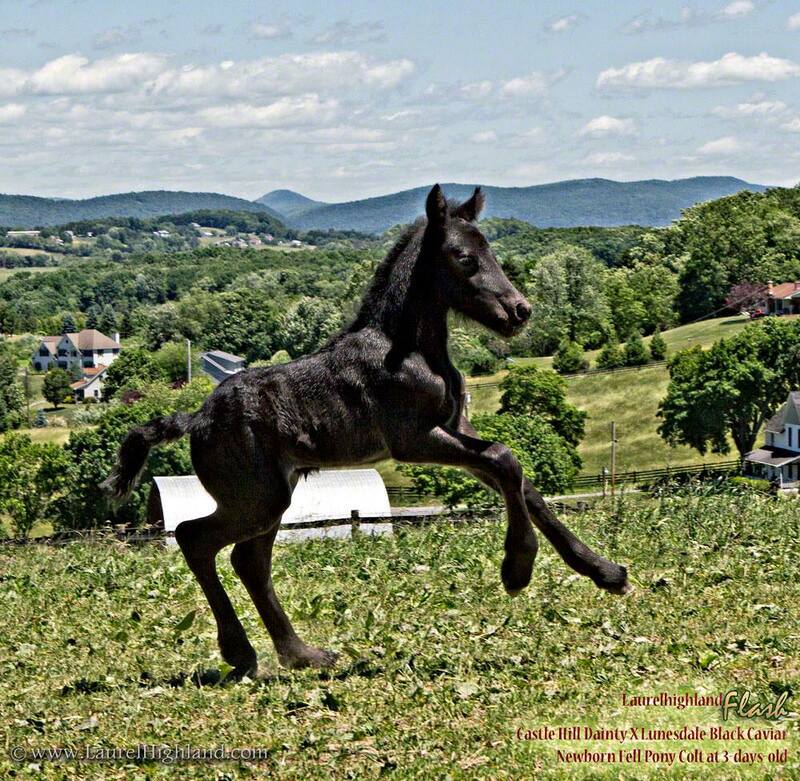 Beautiful 2016 Colt foal unexpectedly available (had been reserved as a filly only!) He is solid black. Contact us for further information and pricing. 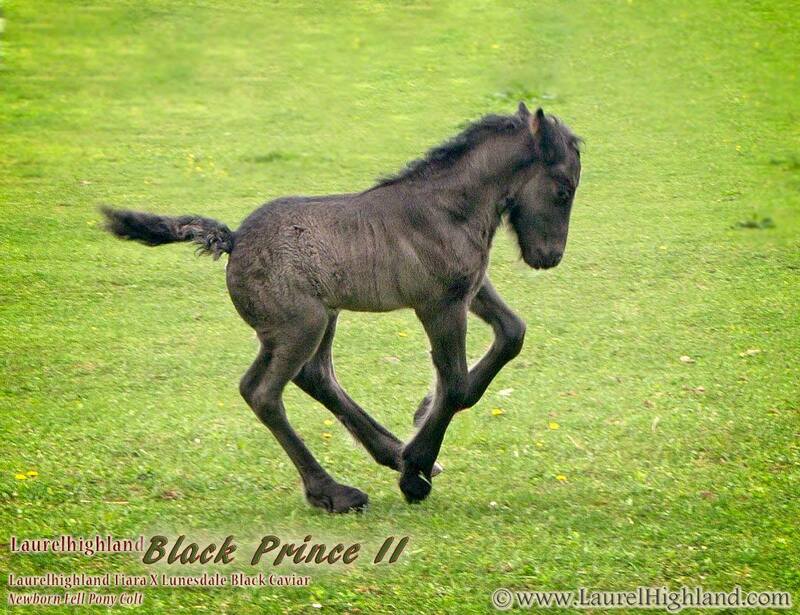 Unless otherwise noted, foals are expected to have black adult color. AGAIN, WE OCCASIONALLY ALSO HAVE OLDER STOCK AVAILABLE FOR SALE, BUT THEY RARELY MAKE IT ONTO THIS SALES LIST! PLEASE CONTACT US IF YOU ARE INTERESTED. 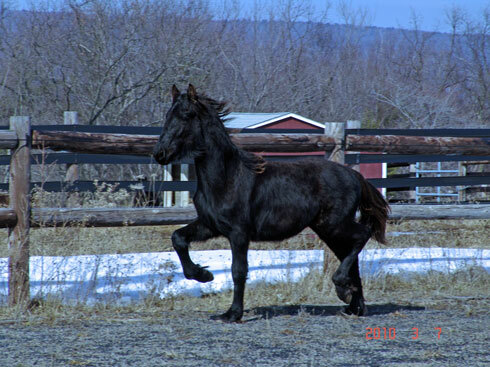 and registered with the Fell Pony Society (UK) before transfer to new owner. 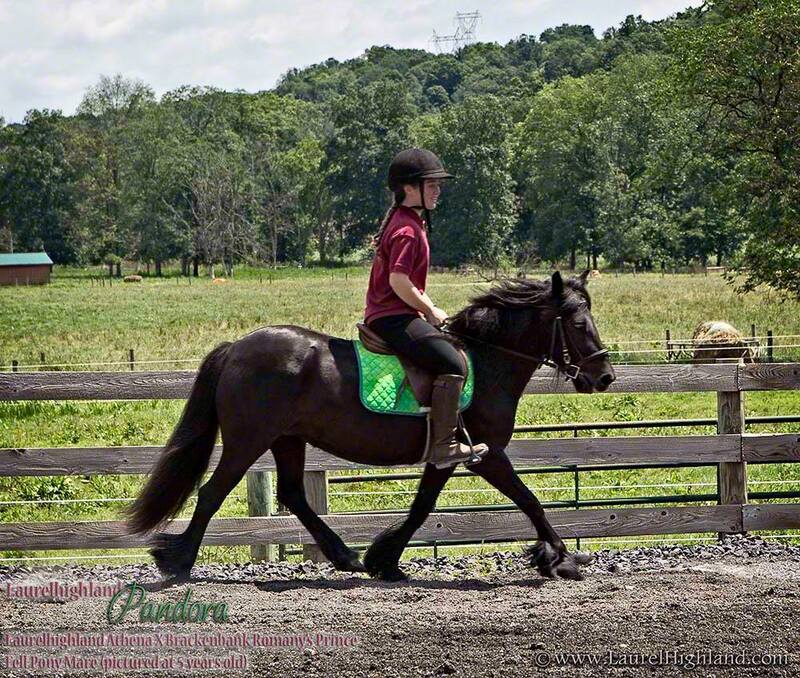 Laurelhighland Pandora is a beautiful, jet black, purebred, FPS-registered Fell Pony mare that was professionally started under saddle this year. 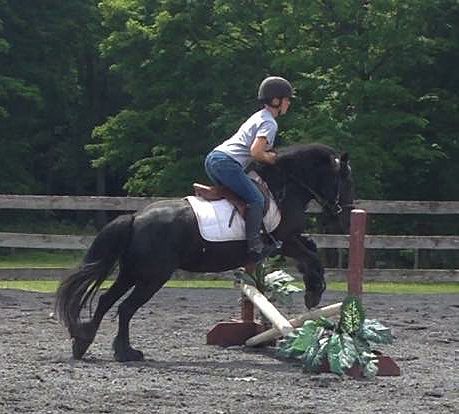 She is smart, good-natured and generally easy to handle, and seems to enjoy working under saddle. She is approx. 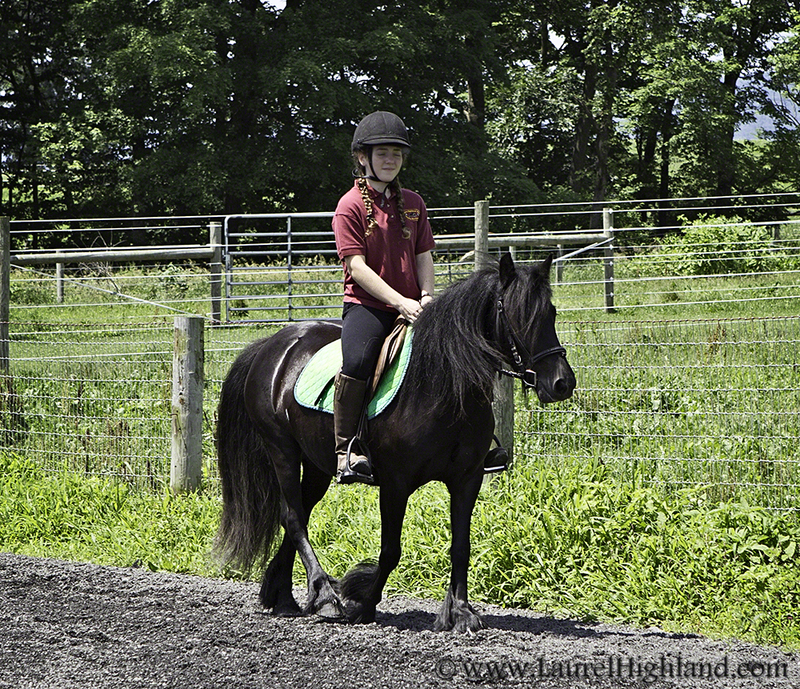 13 hh and well put-together with compact but powerful build, excellent bone and deep girth. She has a beautiful head and lots of straight/silky feather. She has a decent mane (growing back after she unfortunately damaged it grazing between fence rails!) and should eventually be quite long again! 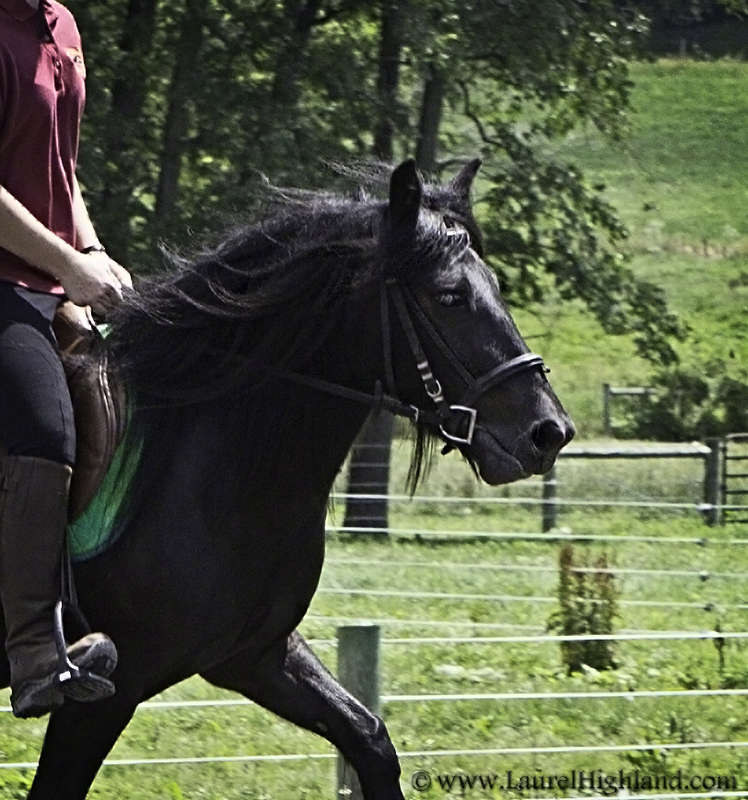 We are only considering selling her to a good home as our daughter is too busy with school and does not have time to ride her, and it is a shame that she is not being ridden and enjoyed! She has not yet been bred but she is FIS-clear. 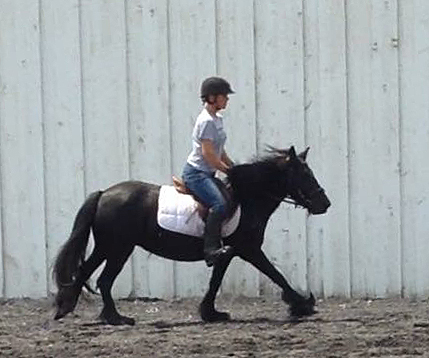 She is very well-bred -- her sire was champion colt at the FPS Breed Show before import; and all grandparents are champion ponies as well, including 4X FPS Stallion Supreme Champion Murthwaite Look at Me. If we do not find a good home that is a good match for her, she will not be sold but would probably breed her next year, as we expect her to make an excellent broodmare. Serious inquiries only -- please contact info@laurelhighland.com for pricing information and other questions about her. Photos are from last winter and this summer -- both during and after training. his offspring with his great bone and fantastic movement. He also has foals to his credit in England and Belgium, bred via AI. "Misty" is a super-friendly, very quiet-natured filly with excellent conformation and movement and excellent bone. She is a nice strong filly and should make 13.2-13.3. She is very closely-related to our Supreme Champion mare, Laurelhighland Sapphire (same dam and their sires are father and son.) 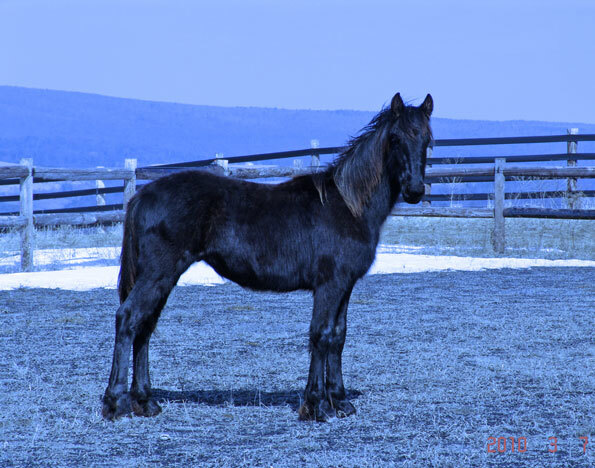 She is also a full sister of Laurelhighland Jack of Diamonds (pictured below on this page), who was exported to Alberta, Canada and has passed the stallion licensing exam required by the Fell Pony Society. Jack of Diamonds also recently won Reserve Supreme Championship in-hand at the Wild Rose Welsh and Open Pony Shoow in Canada. For more information, please contact us. 2012 colts as yearlings, pictured together late May, 2013. Laurelhighland Model is shown on left, and Laurelhighland Jack of Diamonds is shown on right. 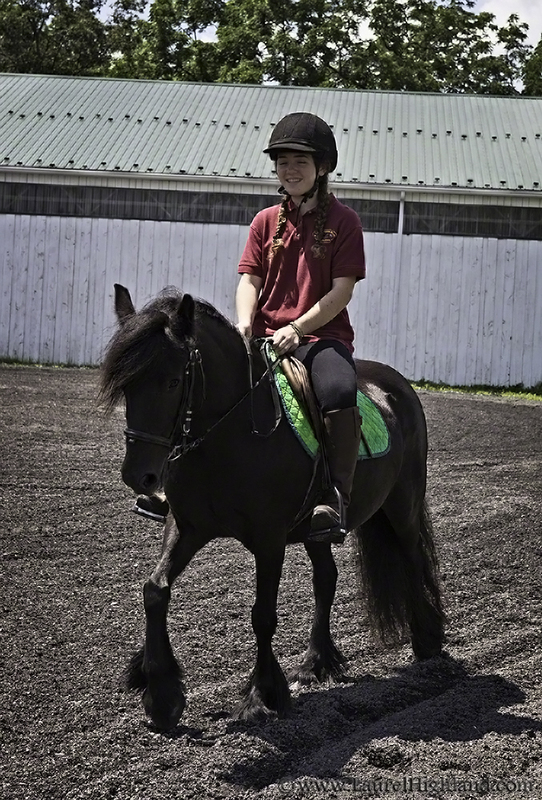 Jack of Diamonds was subsequently exported to Alberta, Canada and young Model became Nebraska's first Fell pony! the famous Anton 343 (shown below) who is well-known for his tremendous amount of hair and stunning good looks! 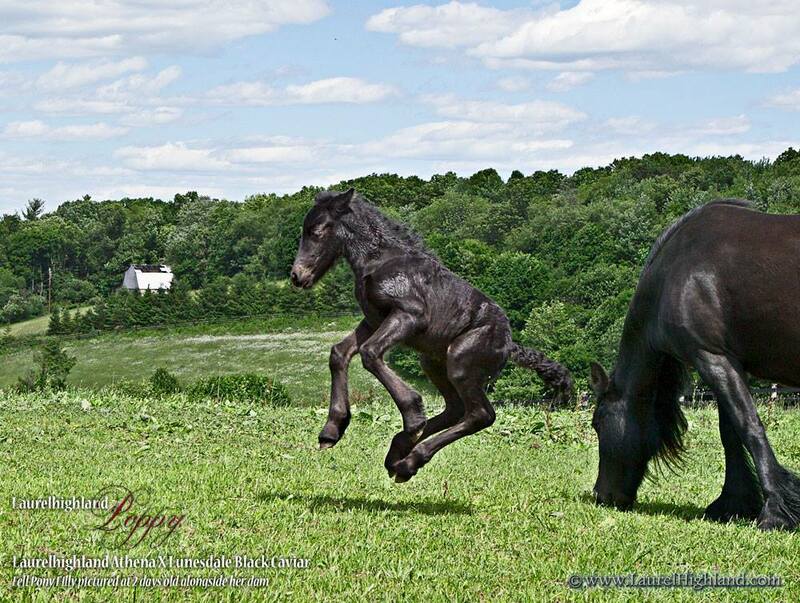 Friesian foals are imprinted, extensively handled, halter-trained, DNA-tested, and registered. Note that following the passing of our beloved Friesian mare, Sofia, we are not currently expecting any more Friesian foals at this time. Copyright � 1999-2017 by Laurel Highland Farm. All rights reserved.